Blackjack is a card game played with several decks, commonly four, six or eight. Standard 52-decks are used. It is based on the game of 21. 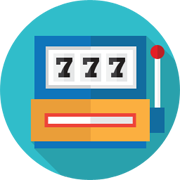 Rules may vary slightly through each Microgaming Casino, so always check them before playing. Playing cards were probably invented in China. The earliest cards were domino cards that represented the scores thrown by a pair of dice, in similar way to dominos tiles. Chinese money cards evolved into modern playing cares. They has four that included coins, strings of coins, myriad strings and tens oh myriad of strings. Playing Cards, similar to those used today, arrived in Europe in the 1370's. They originally has 52-card decks and suits of swords polo sticks, cups, and coins. Each suit had the numbers 1 to 10 and three court cards, which the Europeans changed into knights. There were many design changes. The symbols on the cards varied with different cultures. The suits of hearts, spades, diamonds and clubs come from French cards and have continued to be used in the present day. Blackjack is derived from the game of 21. It was not very popular when it was first introduced to American Casinos. To increase interest, odds of ten to one were offered for a hand comprising an ace and one of the blackjacks, giving the game the name blackjack. The game became popular when researches found that it was possible to overcome the casinos advantage by using a basic strategy. 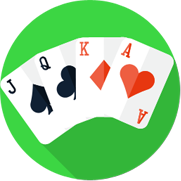 The basic strategy was developed from computer simulation of the game to find the best moves to make depending on the cards dealt. Each card in the deck is assigned a value, number cards 2-9 are face value, jacks, queens, and kings are worth 10 points, aces are worth either a 1 or an 11. If you choose to use the ace as an 11, the hand is considered soft, its considered hard if you choose to use it as a 1. Hit: You re asking the dealer to give you another card. Your may hit as many times as you would like without going over 21. If you go over 21 this is called a bust and you lose. Stand: You like the cards you are holding, and you want to stay with what you've got. Double Down: You want to double your bet for a one-card hit. After you've received this card, you can not hit again. Split: This allows you to divide a pair of like cards into two different hands. Depending upon which table you're on, you may re-split should you receive another like card. Also, on some tables you may double down after receiving a second card to your split hands. Generally, split Aces automatically receive only a second card and no further options will be presented. Surrender: You want to forfeit your hand because you feel that the dealer will beat you (e.g. you've got 15 and the dealer is showing an Ace or a 10). By surrendering, you only lose half your bet. You must surrender when holding two cards. After a hit, this option will not be available.